Salesforce Financial Services Cloud is a powerful platform that brings together wealth management tools and CRM, as well as multiple features that work towards personalizing client relationships and giving users an end-to-end view of how well their company’s finances are doing. Engagement cards and collaboration tools are also present and analytics help users to make business decisions that are smarter and backed by data. No matter the size of the business, users can pick the method they want to guide customers on their journey down the sales funnel. Multiple business groups and household trusts can be mapped out and connected so users can determine how best to interact with them. The platform also provides users with insights that are actionable when it comes to their business networks and the behaviors of their clients. It does this through its AI capabilities and its integrated dashboards. A business’s growth can be accelerated and its reach expanded with this tool, as it makes the performance of wealth management tasks in line with the goals of CRM easy. Round-the-clock toll-free support is also available should users encounter any problems in the implementation and maintenance of the software. The main benefits of Salesforce Financial Services Cloud are its streamlined wealth management, its customer service, and its ability to secure company data. Financial management in line with CRM goals is made easy by Salesforce Financial Services Cloud. Financial goals can be monitored, new opportunities determined, and client relationships grew with this tool. Wealth management is made efficient by the traditional CRM functions used by Salesforce Financial Services Cloud. Specific accounts can be linked to contacts, and financial holdings can be rolled-up to different levels, thanks to the CRM facet of the software. Industry-specific features are also available to provide a user experience that is more personalized. The software’s built-in Lightning capability makes for faster and more efficient wealth management operations. Client dashboards and proactive engagement cards all boost the productivity of advisors. All of this allows users to focus on more critical responsibilities rather than repetitive tasks. Users of Salesforce Financial Services Cloud can easily reach their client base via email, social media, and other forms of communication using this one platform. They also get client insights and persona-based analytics thanks to the platforms leveraging of AI. This makes existing client interaction more efficient and prospect engagement more effective. 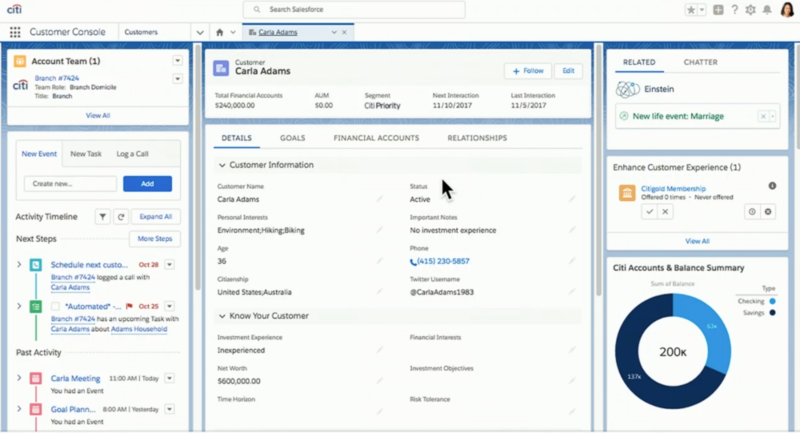 Aside from making client engagement more streamlined, Salesforce Financial Services Cloud also provides users with the tools they need for secure collaboration. Users can connect with client associates, insurance agents, and other experts on finance using the in-context collaboration provided by the platform. CRM data can be accessed in real time using the Salesforce Inbox feature, so deals can be closed faster. There are multiple layers of security that come with Salesforce Financial Services Cloud that gives users the ability to track data access and usage. Client information is kept confidential through actions like platform encryption, field audit trail, and event monitoring.